The fundamental dogma of Christianity; the concept of the union in one God of Father, Son, and Holy Spirit as three infinite persons. It was the Nicene Council and even more especially the Athanasian Creed that first gave the dogma its definite formulation: "And the Catholick Faith is this: That we worship one God in Trinity, and Trinity in Unity; Neither confounding the Persons; nor dividing the Substance." Equalization of the Son with the Father marks an innovation in the Pauline theology: "Yet to us there is one God, the Father, of whom are all things, and we unto him; and one Lord, Jesus Christ, through whom are all things, and we through him" (I Cor. viii. 6, R. V.), while in another passage the Holy Ghost is added (ib. xii. 3; comp. Titus ii. 13), thus rapidly developing the concept of the Trinity (II Cor. xiii. 14). Although the Judæo-Christian sect of the Ebionites protested against this apotheosis of Jesus ("Clementine Homilies," xvi. 15), the great mass of Gentile Christians accepted it. The Holy Ghost as the third person of the Trinity could originate only on Gentile soil, since it was based on a linguistic error. The "Gospel According to the Hebrews," which was once held in high esteem, especially in Ebionitic circles, still regards the term "mother" as equivalent to "Holy Ghost" (Origen, Commentary on John ii. 12; see Preuschen, "Antilegomena," p. 4, Giessen, 1901; Henneke, "Neutestamentliche Apokryphen," p. 19, Tübingen, 1904), since in Aramaic, the language of this Gospel and possibly the original dialect of all the Gospels, the noun "ruḥa" (spirit) is feminine (comp. the Gnostic statement ἐντεῦθεν; Φάλτν ἀναδεχΘῆναι μητέρα καὶ υίόν Irenæus, "Adversus Hæreses," i. 271). The Ophites, furthermore, actually taught a trinity of father, son, and mother (Hilgenfeld, "Ketzergeschichte," p. 255); and the fact that the Church father Hippolytus found among the Ophites the Assyrian doctrine of the trinity of the soul (Hilgenfeld, l.c. p. 259) justifies the assumption of a kinship of the dogma of the Trinity with older concepts. The Mandæans also believe ruḥa to be the mother of the Messiah, though they regard them both as demons (Brandt, "Die Mandäische Religion," p. 124, Leipsic, 1889). The original trinity must, therefore, have included a feminine being, since thus alone could the concept of ruḥa have been obtained, and only after this form of trinity had been accepted in Judæo-Christian circles could the Greek τὸ φνεῦμα be regarded as a person, although it then became masculine instead of feminine. Philo's doctrine of the Logos is connected with this belief. God, who created His son in His own image (Gen. ii. 7), thereby made Himself triform, so that He Himself and the biform first Adam (= Logos = Jesus) constituted the first trinity. The controversies between the Christians and the Jews concerning the Trinity centered for the most part about the problem whether the writers of the Old Testament bore witness to it or not, the Jews naturally rejecting every proof brought forward by their opponents. The latter based their arguments on the Trisagion in Isa. vi. 3, a proof which had been frequently offered since Eusebius and Gregory of Nazianzus. The convert Jacob Perez of Valentia (d. 1491) even found an allusion to the Trinity in the word "Elohim," and Luther saw distinct traces of the doctrine in Gen. i. 1, 26; iii. 21; xi. 7, 8, 9; Num. vi. 22; II Sam. xxiii. 2; and Dan. vii. 13. The Jewish polemics against this doctrine date almost from its very conception. Even in the Talmud, R. Simlai (3d cent.) declared, in refutation of the "heretics," "The three words 'El,' 'Elohim,' and 'Yhwh' (Josh. xxii. 22) connote one and the same person, as one might say, 'King, Emperor, Augustus'" (Yer. Ber. ix. 12d), while elsewhere he substitutes the phrase "as if one should say, 'master, builder, and architect'" (ib. 13a). There are, however, no other allusions to the Trinity in Talmudic literature, as has been rightly pointed out by Herford ("Christianity in Talmud and Midrash," p. 395, London, 1903), since the polemics of the rabbis of that periodwere directed chiefly against dualism ( ). Another polemic, which is noteworthy for its antiquity and its protagonists, was the disputation between Pope Sylvester I. (314-335) and the Jew Noah (Migne, "Patrologia Græca," viii. 814). "Fra Pablo asked me in Gerona whether I believed in the Trinity [ ]. I said to him, 'What is the Trinity? Do three great human bodies constitute the Divinity?' 'No!' 'Or are there three ethereal bodies, such as the souls, or are there three angels?' 'No!' 'Or is an object composed of three kinds of matter, as bodies are composed of the four elements?' 'No!' 'What then is the Trinity?' He said: 'Wisdom, will, and power' [comp. the definition of Thomas Aquinas cited above]. Then I said: 'I also acknowledge that God is wise and not foolish, that He has a will unchangeable, and that He is mighty and not weak. But the term "Trinity" is decidedly erroneous; for wisdom is not accidental in the Creator, since He and His wisdom are one, He and His will are one, He and His power are one, so that wisdom, will, and power are one. Moreover, even were these things accidental in Him, that which is called God would not be three beings, but one being with these three accidental attributes.' Our lord the king here quoted an analogy which the erring ones had taught him, saying that there are also three things in wine, namely, color, taste, and bouquet, yet it is still one thing. This is a decided error; for the redness, the taste, and the bouquet of the wine are distinct essences, each of them potentially self-existent; for there are red, white, and other colors, and the same statement holds true with regard to taste and bouquet. The redness, the taste, and the bouquet, moreover, are not the wine itself, but the thing which fills the vessel, and which is, therefore, a body with the three accidents. Following this course of argument, there would be four, since the enumeration should include God, His wisdom, His will, and His power, and these are four. You would even have to speak of five things; for He lives, and His life is a part of Him just as much as His wisdom. Thus the definition of God would be 'living, wise, endowed with will, and mighty'; the Divinity would therefore be fivefold in nature. All this, however, is an evident error. Then Fra Pablo arose and said that he believed in the unity, which, none the less, included the Trinity, although this was an exceedingly deep mystery, which even the angels and the princes of heaven could not comprehend. I arose and said: 'It is evident that a person does not believe what he does not know: therefore the angels do not believe in the Trinity.' His colleagues then bade him be silent"
The boldness of the Christian exegetes, who converted even the "Shema'," the solemn confession of the Divine Unity, into a proof of the Trinity (Maimonides, in "Teḥiyyat ha-Metim," beginning), furnishes an explanation of the bitterness of the Jewish apologists. Joseph Ḳimḥi assailed the doctrine of the Trinity first of all ("Milḥemet Ḥobah," p. 19a), refuting with weighty arguments the favorite proof based on Gen. xviii. 1-2, where Yhwh is described as first appearing alone to Abraham, who later beholds two persons (comp. Abraham ibn Ezra's commentary, ad loc.). Simeon ben Ẓemaḥ Duran, who also refuted the Trinitarian proofs, added: "The dogma itself is manifestly false, as I have shown by philosophic deduction; and my present statements are made only with reference to their [the Christians'] assertions, while the monk Nestor accepted Judaism for the very reason that he had refuted them" ("Milḥemet Ḥobah," p. 48b). Noteworthy among modern polemics against the Trinity is Joshua Segre's critique ("Zeit. für Hebr. Bibl." viii. 22). The Cabala, on the other hand, especially the Zohar, its fundamental work, was far less hostile to the dogma of the Trinity, since by its speculations regarding the father, the son, and the spirit it evolved a new trinity, and thus became dangerous to Judaism. Such terms as "maṭronita," "body," "spirit," occur frequently (e.q., "Tazria'," ed. Polna, iii. 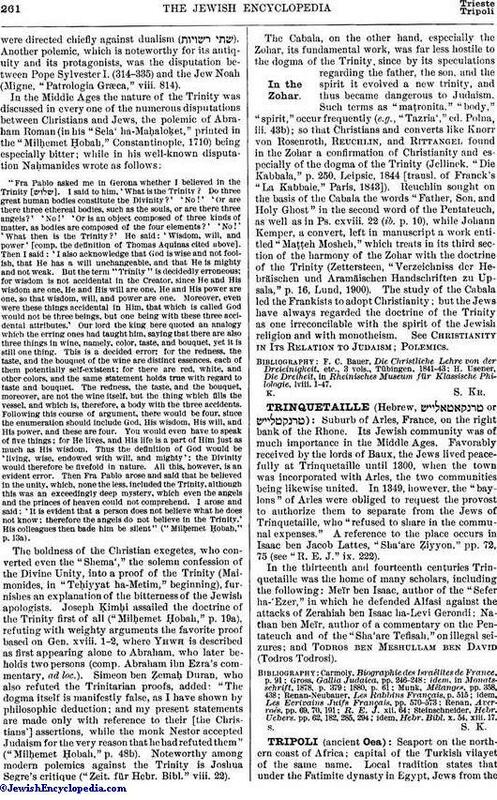 43b); so that Christians and converts like Knorr von Rosenroth, Reuchlin, and Rittangel found in the Zohar a confirmation of Christianity and especially of the dogma of the Trinity (Jellinek, "Die Kabbala," p. 250, Leipsic, 1844 [trans]. of Franck's "La Kabbale," Paris, 1843]). Reuchlin sought on the basis of the Cabala the words "Father, Son, and Holy Ghost" in the second word of the Pentateuch, as well as in Ps. cxviii. 22 (ib. p. 10), while Johann Kemper, a convert, left in manuscript a work entitled "Maṭṭeh Mosheh," which treats in its third section of the harmony of the Zohar with the doctrine of the Trinity (Zettersteen, "Verzeichniss der Hebräischen und Aramäischen Handschriften zu Upsala," p. 16, Lund, 1900). 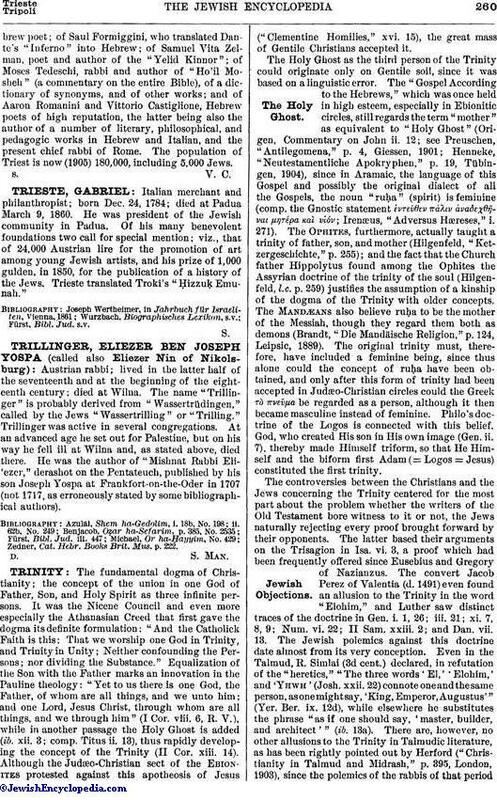 The study of the Cabala led the Frankists to adopt Christianity; but the Jews have always regarded the doctrine of the Trinity as one irreconcilable with the spirit of the Jewish religion and with monotheism. See Christianity in Its Relation to Judaism; Polemics. H. Usener, Die Dreiheit, in Rheinisches Museum für Klassische Philologie, lviii. 1-47.